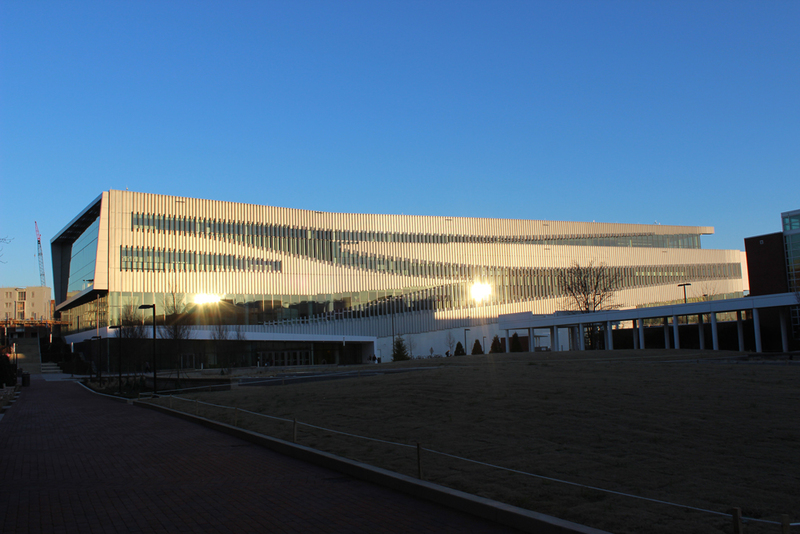 The James B. 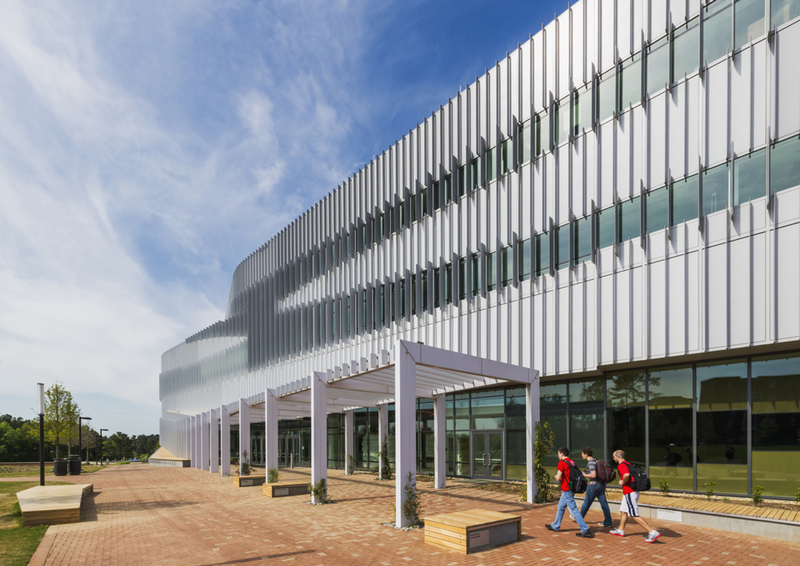 Hunt Jr. Library is the second main library of North Carolina State University and rests at the southern end of NC State’s Centennial Campus Academic Oval. 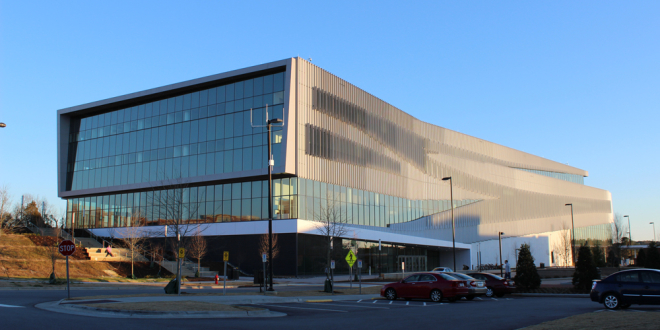 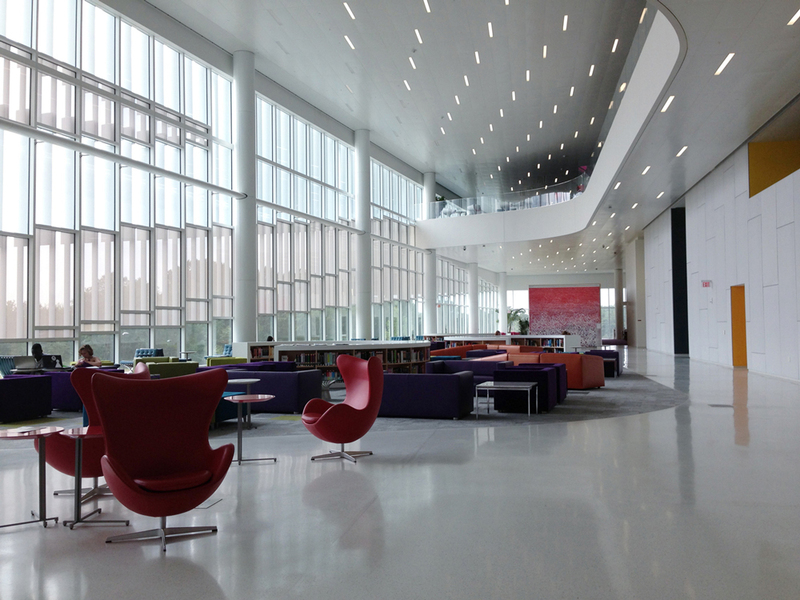 Studio Snøhetta’s integrated architecture and also designed the Hunt Library’s surrounding landscape. 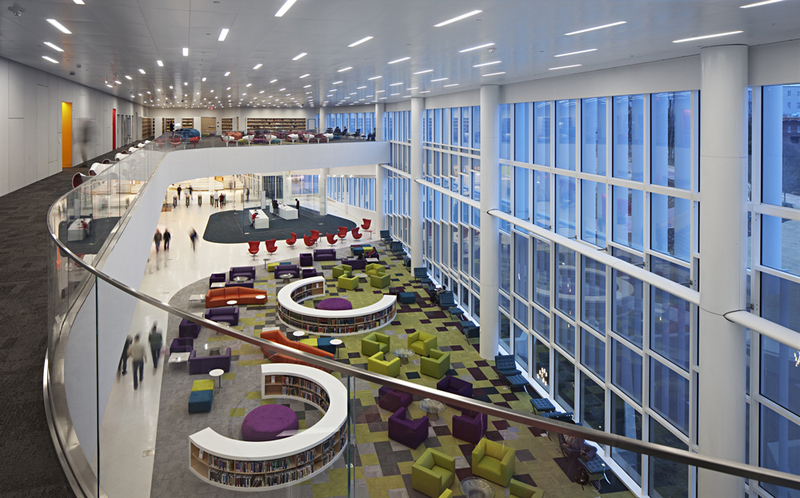 Library building covers more than 20,500 m2, 27 m high at its tallest point and with its five floors can hold 1,700 students. 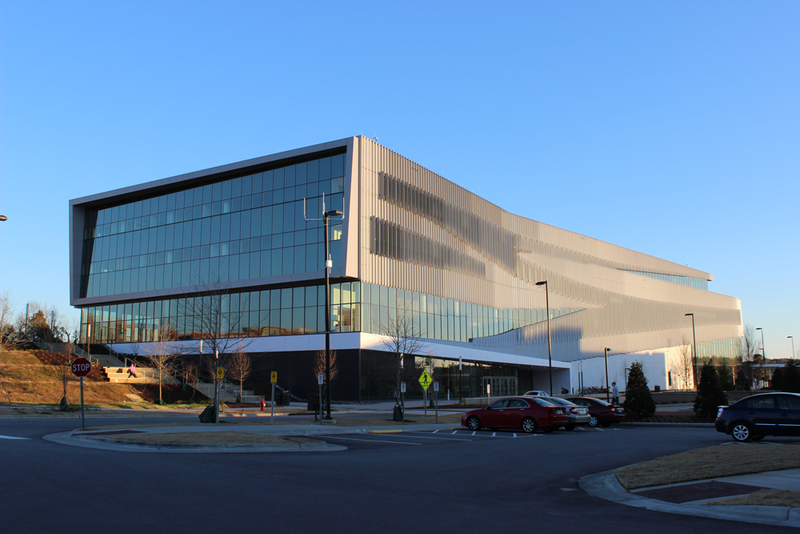 The Hunt Library plays a part in NCSU’s sustainability plan 31% of building materials are made from recycled content. 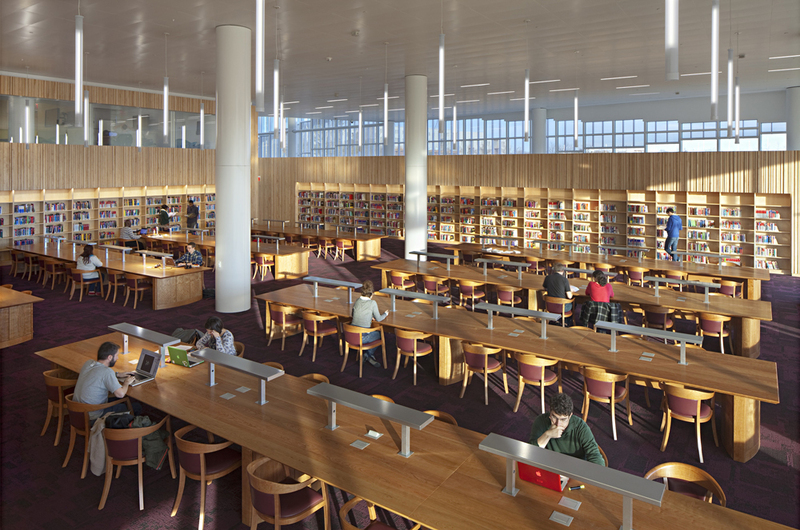 Most of its wood comes from sustainable forests, and the interior makes extensive use of solar energy and natural light. 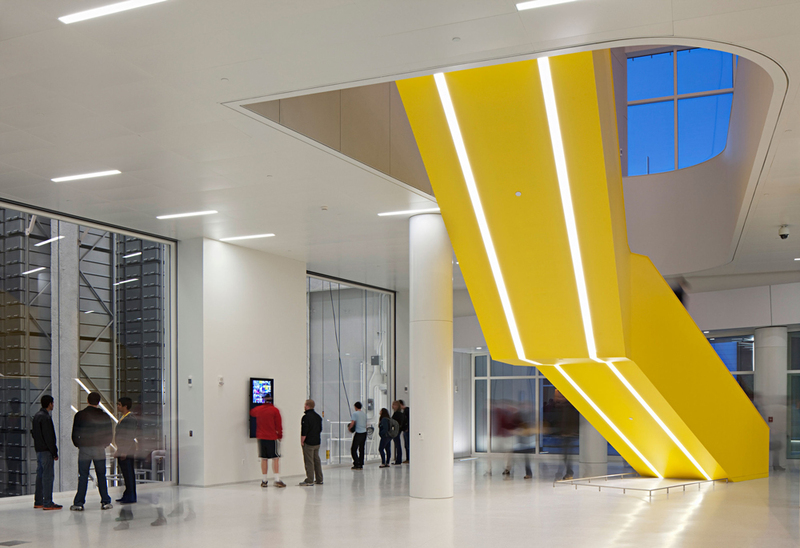 Also include a roof-mounted solar water heater, low-flow fixtures, and a partial green roof. 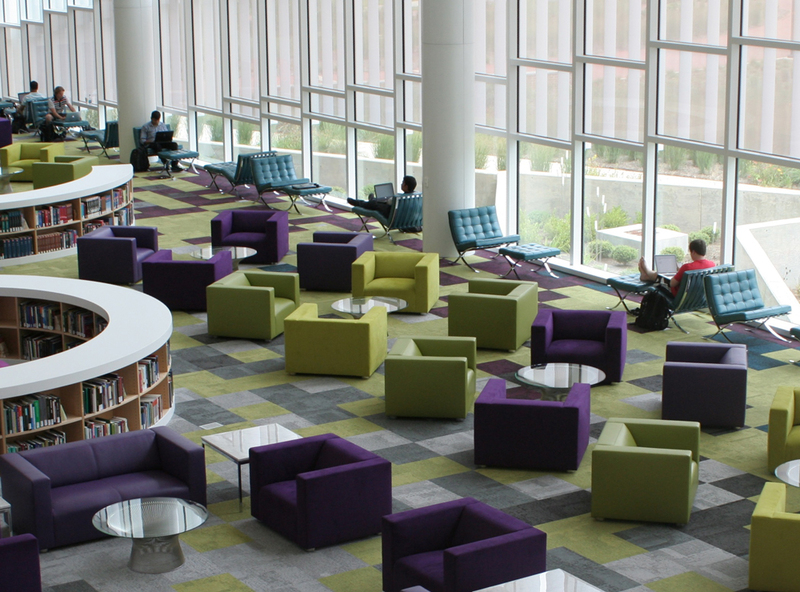 Wide open spaces connect all floors of the library and open stairs emphasize an interactive and social environment alongside more focused study areas. 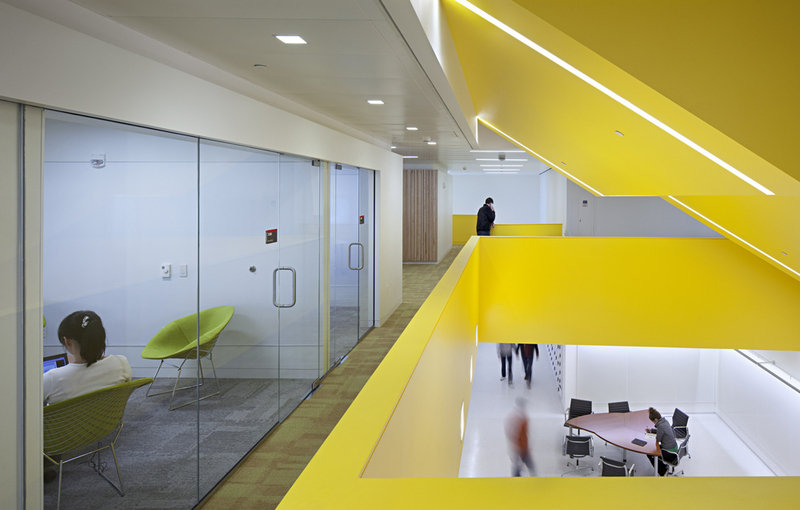 Yellow stairways leading from the ground-floor entrance to the main lobby, while elevator banks are a more subdued aubergine. 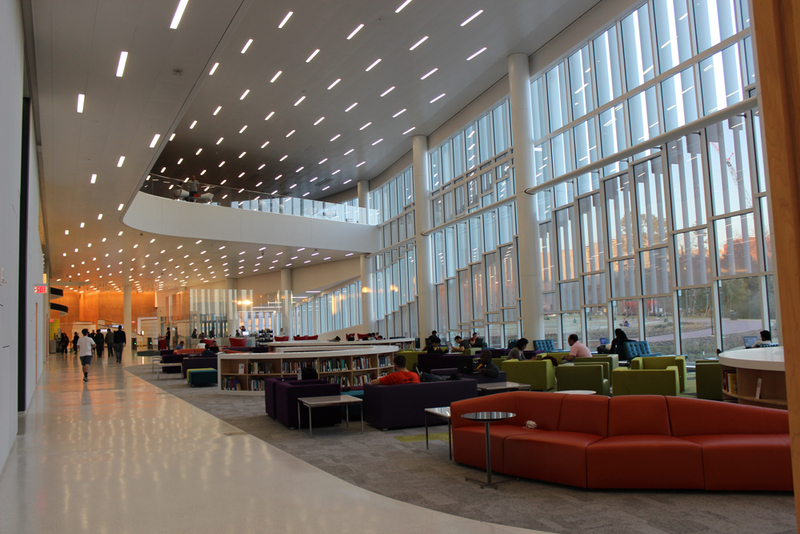 The library lobby has double-height. 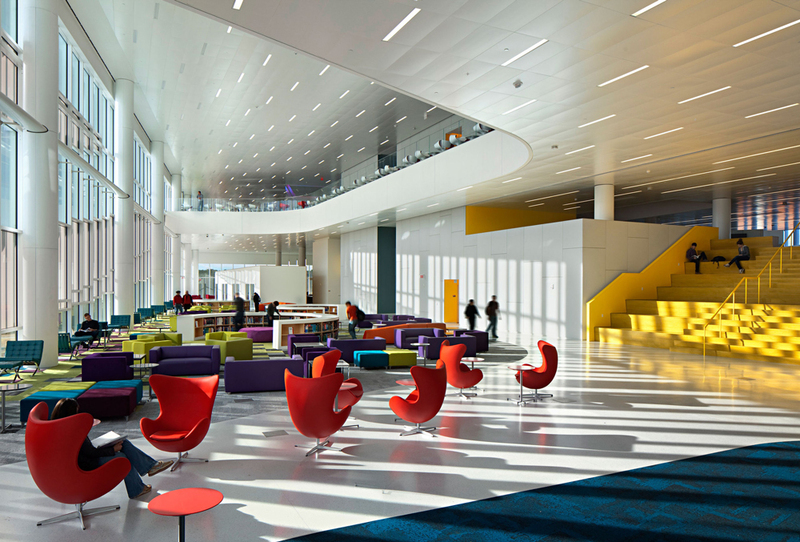 Space gives way to a triple-height reading lounge with an east-facing panoramic view. 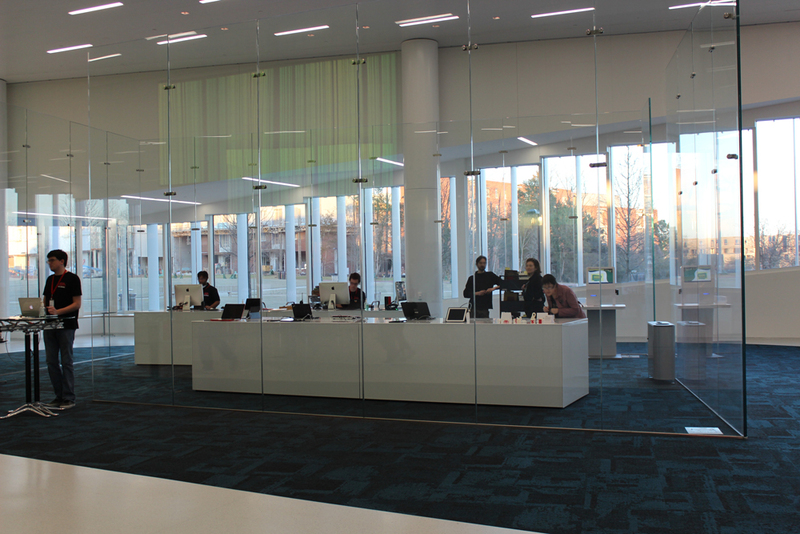 There is also a quiet reading room beyond is lined with glazed group study rooms that overlook the double-height space from the third floor. 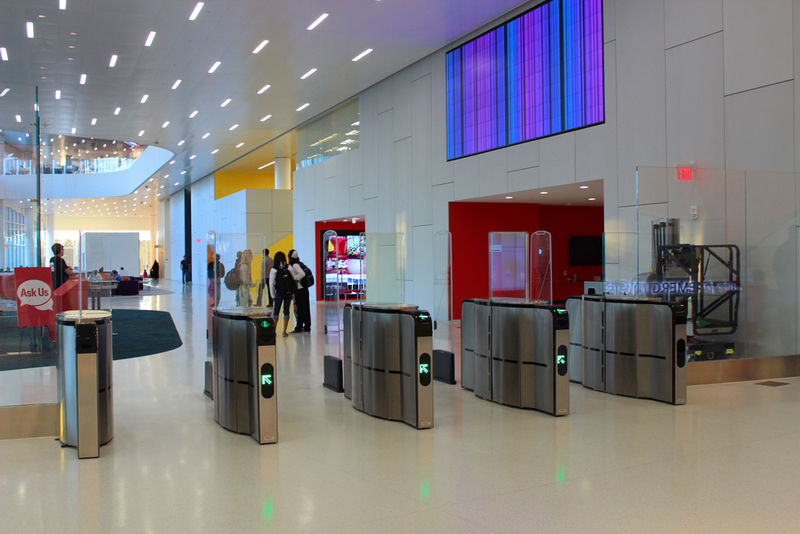 Visitors have their choice of color-coded vertical circulation paths to move between levels. 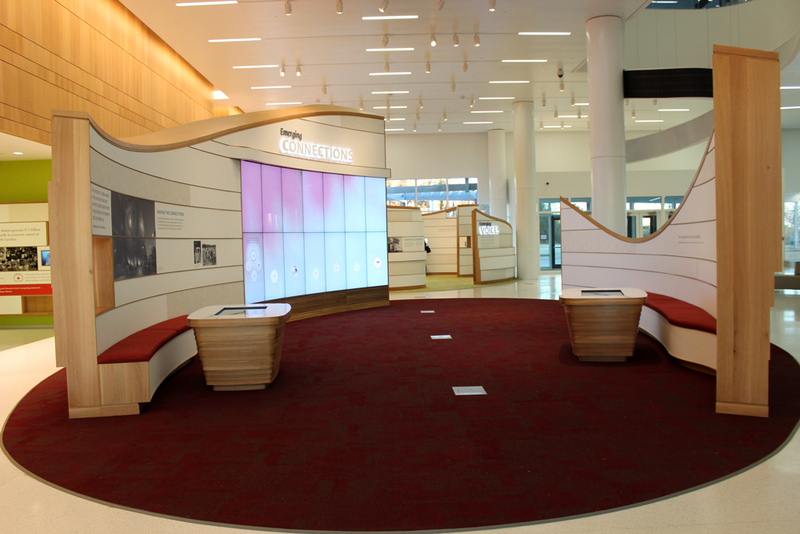 A collection of more than 60 types of designer furnishings, is arranged by type around the reading rooms. 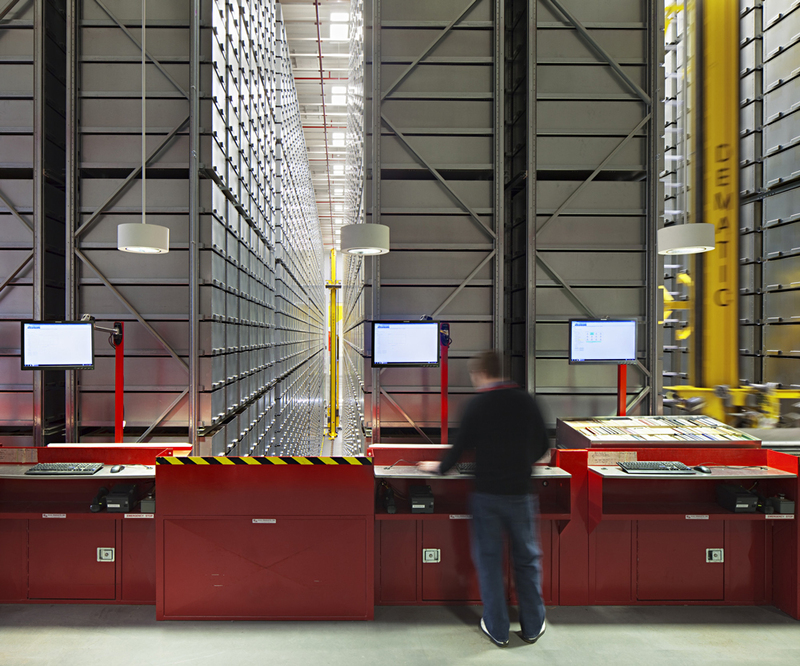 Entering the library from the lower level, visitors immediately encounter Robot Alley, automated book delivery system – BookBot. 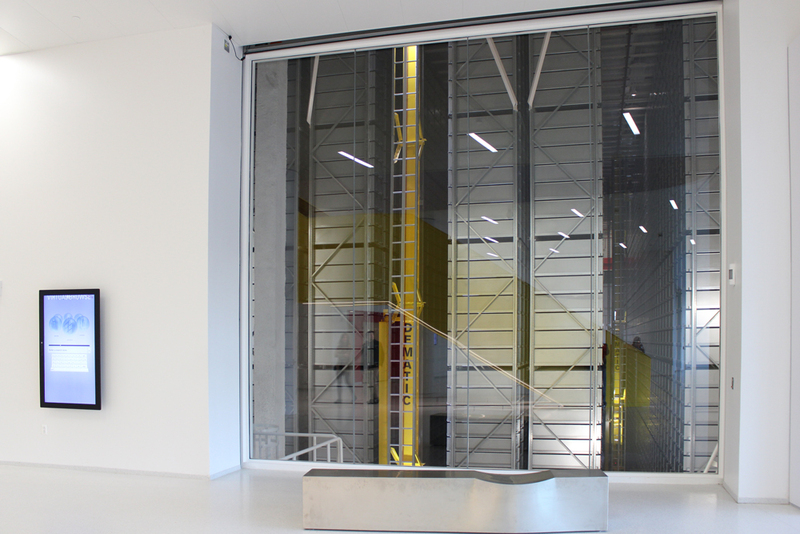 It can be watched when it retrieve materials through a glass wall on the first floor. 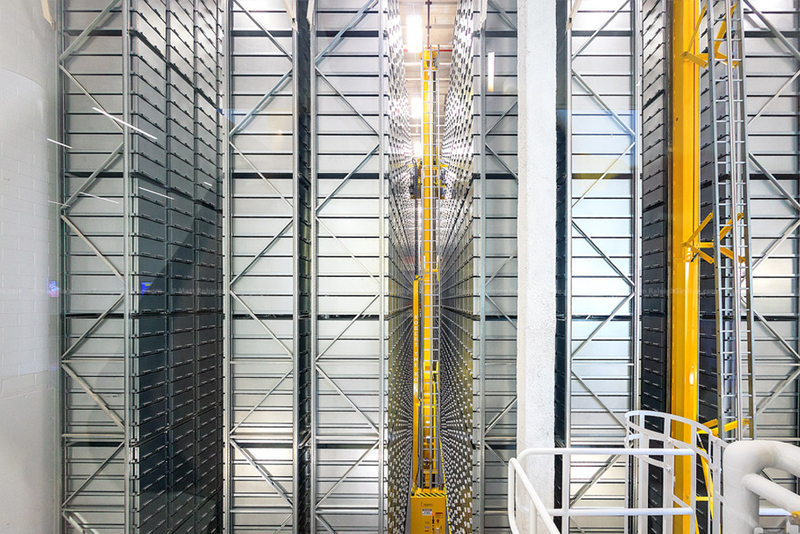 It is capable of holding two million volumes collection automated storage. 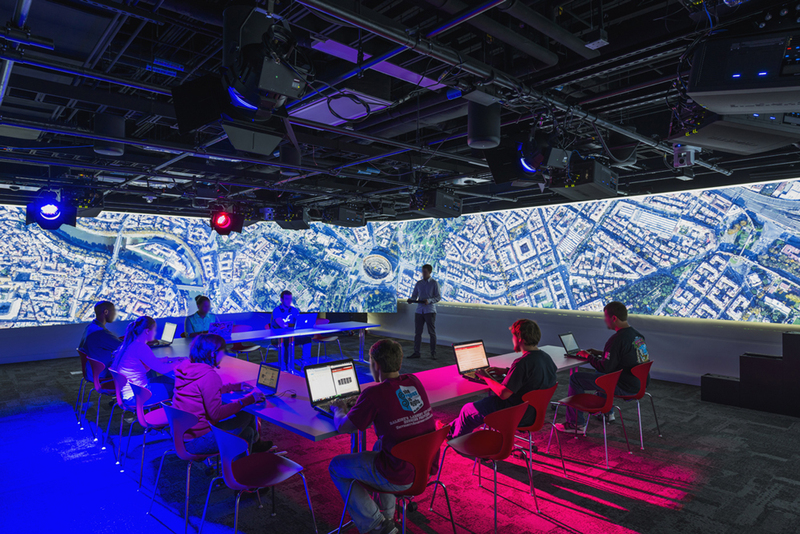 These innovative building features give faculty and students hands-on experience with the large-scale visualization tools. 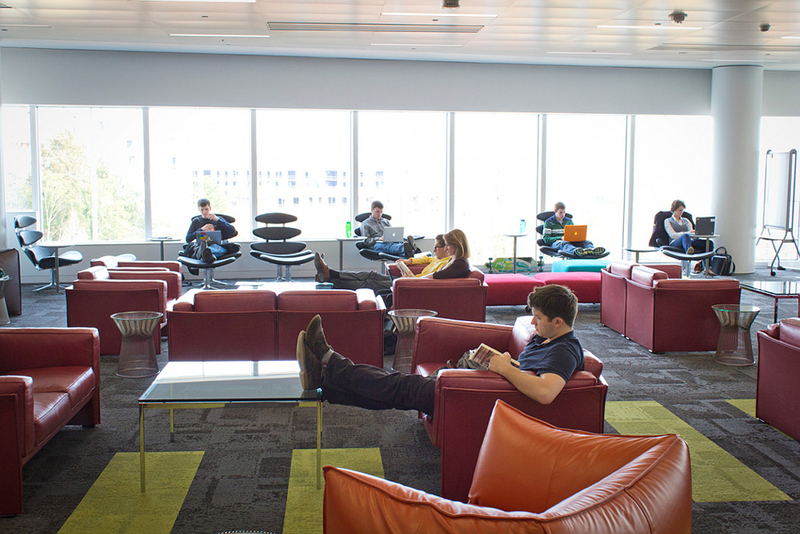 The Game Lab serves as a testing lab for the video game design, to explore collaborative game design and development program. 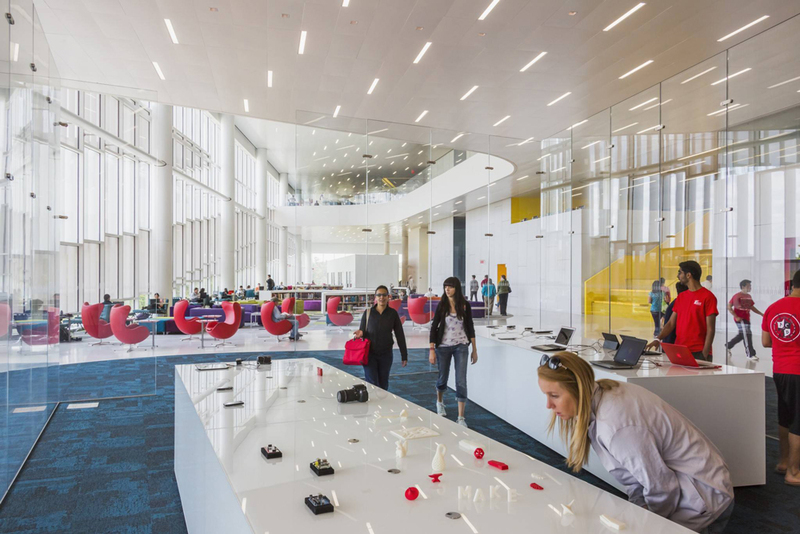 The library’s Teaching and Visualization Lab, the Creativity Studio, a 3D printing workshop and extensive digital media production facilities enable faculty and students with rapid prototyping, modeling, and visualization capabilities.